By using Persona, the individual spends less time updating their data and service providers can access the latest version of the customer data. – To ​prevent fake news​, by providing a decentralized identity management system, Persona will provide the trust level we all need when we rely on news; based on the public Persona profile of any content creator, we can track down news to their source. Persona harnesses the power of blockchain technology for hassle-free identity management. It’s like a single sign-on for all the websites you are already using. And the source for the future web application you’re not using right now. Your digital identity is based on cross-verification made by multiple entities. Search for Persona notaries near you and get your identity check up to 90%. 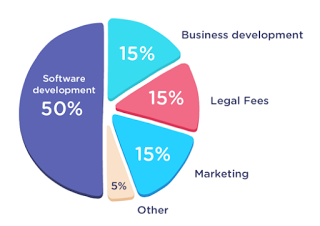 The rest of 10% is based on a KYC process performed with a corporate partner (a service provider that you are already enrolled with). You are the de facto owner of your data. Therefore, in order to have access to a service or device, you need to explicitly agree to share it. The party entrusted with this kind of data is supposed to take all the necessary actions in order to protect it and protect you. You are in the center. Let’s build from there. Persona is about you and your interaction with the outside world. You’ll be able to create your own halo based on your data: medical records, fitness progress or social media accounts. You’ll be able to give access or revoke access to your details as you please since they’re yours. – 1,500,000 PRS​ allocated to the bounty. – Audit of the procedures and setting-up a legalized notary system.